One of 2013’s most highly-anticipated titles eviscerates itself, and ends up clattering to the deck with the thud of Bishop’s bottom-half. Unsurprisingly, like most beloved genre franchises, even an awesome concept like that hasn’t managed to translate very well to the world of video gaming. While the Alien franchise in all its forms has definitely produced a lot of games in its lifetime, very few of them have managed to contain the quality that fans generally hope for, and indeed deserve. Although, when Gearbox Software announced that they’d be releasing the long in-development Aliens: Colonial Marines, many fans found themselves cautiously optimistic. Gearbox has a pretty decent track record after all, with games like the Borderlands series and Brothers in Arms. When the game was released, it was met with quite a bit of pomp and circumstance. Pre-release footage looked fantastic, with a very apparent emphasis on making the entire effort feel like an authentic Aliens experience. One of the other more fascinating aspects is that, according to 20th Century Fox, Colonial Marines is in-continuity with the Alien film series, so this is actually the next element of the story on the planet of LV-426. With an entire movie studio throwing their weight behind at least the creative elements of the game, are we finally allowed to breathe a sigh of relief? Do we finally have the game we want featuring Xenomorphs, facehuggers, and pulse rifles? Well, to put it bluntly, no. Absolutely not. On the surface, Aliens: Colonial Marines evokes the action-packed elements of the film it takes its name from, but screenshots like this one don’t capture just how broken many aspects of the gameplay experience really are. Let me start off with the elements that do work in the game’s favor, because to call it a complete mess would, I think, do a disservice to a developer that obviously tried to make this feel like an authentic Aliens experience. If you pop in your Aliens Blu-ray or DVD immediately before starting the campaign in Colonial Marines, you’ll note a lot of faithfulness to the environments, the scale, and to a degree, even the character interactions. Very much like the film this game spins out of, many of the opening environments in Colonial Marines feel very broad and large, but still somehow tinged with the uncertainty usually only found in claustrophobia. When the Xenomorphs make their presence felt for the first time, even the biggest environments in the game feel very uncertain, because they’re dark. That darkness leads you to move your flashlight perilously in every direction, since you don’t know where an alien will pop out. Points for authenticity: when you board the Sulaco, you see evidence of the final confrontation in Aliens between Ripley, Bishop and the Queen. The bottom-half of Bishop is even still on the deck, after he was cut in half by the Queen during the film’s climax. There are great touches like that all over the place. In the medical bay, for instance, where Ripley and Newt desperately tried to keep a facehugger off of them, you see the turned-over bed and the dead facehugger lying lifeless on its back near the corner. It’s that level of authenticity that really makes you feel like you’re inside a continuation of the film. Even some of the original actors, most notably Lance Henriksen as Bishop and even Michael Biehn as Corporal Hicks, make the entire thing feel very true to the franchise it represents. There are a lot of easter eggs, including dog tags of the marines from the film, their weapons (like Hicks’ shotgun or Hudson’s pulse rifle), and even Newt’s doll head. The only problem, though, is that this is a video game and not a CG-animated film. It has to play well, and largely, Colonial Marines falls short in this department. While I liked a lot of the atmospheric touches in the environment (particularly the strobing and smoke effects), it becomes easier to see that the game had been in development for a long time by its use of the graphical engine (which in this case was an update of Unreal 3 with a supposedly “upgraded” renderer). While in some areas the player models look great, as you go further in they start to look pretty dated. Lighting effects play off of plastic-looking skin in pretty odd ways, and environments on the surface of the planet look like they came out of an original Xbox launch title in places. Since I like to get all of the difficulty-related achievements in the first go, I elected to play this game on the hardest difficulty, “Ultimate Badass.” I stuck with it, but I was not happy about it. Many of even the most upgraded weapons were nearly useless in actual combat against the aliens. Even in gameplay not related to difficulty, some of the coolest components of the game are far more tiresome than awe-inspiring. There are a couple of instances where you’re called upon to use a power loader, the same contraption that Ripley fought the Queen off with in the climax of Aliens. What should’ve been one of the coolest components of the entire game, instead the power loader sections were monotonous, difficult to control, and quickly boring. I counted the amount of times I had to hit the “crusher” Xenomorph, and it was nearly 60 before it went down for the count. In the middle of the fight, you have to get into an exact rhythm and account for the game constantly rubber banding you away from where you want to be, and compensate so that you can actually win this boss battle. It was not a winner. 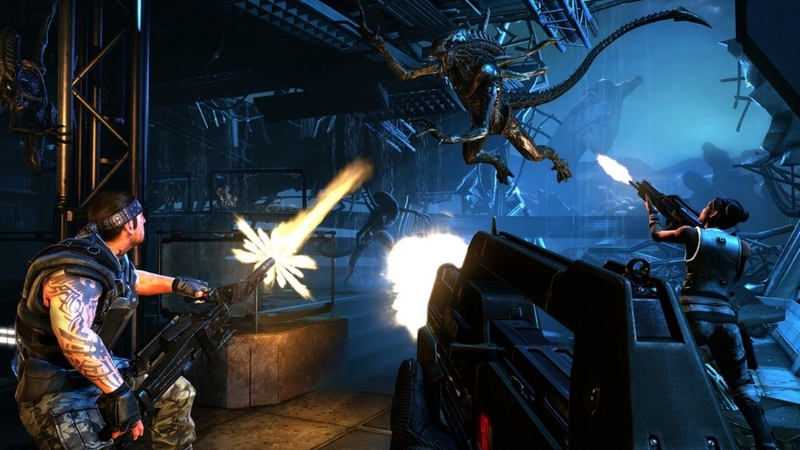 While the game accurately recreates some similarly tense encounters between marines and Xenomorph soldiers found in the film, the stiff shooting mechanics and lack of any real nuance to tackling a specific encounter makes Aliens: Colonial Marines far less special than it could’ve been. Another losing aspect is the AI, which is absolutely crippling for the single player mode since it mostly includes you running with one or two other marines, sometimes more, during your missions. There were several moments in the single player experience where I’d progress pretty far, but couldn’t actually finish because my teammate wasn’t beside me. I backtracked almost an entire level in more than one instance to find my teammate facing a door while stuck in a running animation, which is very bad for a game that’s supposed to rely on a team dynamic. This just brings the point to the forefront that this game has a severe lack of polish that, given the time in development, should not be a drag on it. I understand that there’s a bit of controversy surrounding actual credit for the game’s development, with Gearbox shuffling teams and resources around a lot, and that’s easy to see because the final product is extremely disjointed. The multiplayer component isn’t much to write home about, either. It’s got some basic interactive functionality as well as the ability to play as aliens, but really, it’s faulted by many of the same design flaws as the single player portion and in the age of much better horror and war FPS titles, is sadly forgettable. Like a lot of gamers, I was really looking forward to Aliens: Colonial Marines, but it seems that the perfect storm of developer difficulties, shuffling of resources and teams, changing technologies, and the simple existence of time seriously crippled this game from being what so many franchise fans hoped it would be. Its solid level of attention-to-detail in evoking the Aliens film is almost made entirely irrelevant because of everything else that holds the game back from achieving much of anything positive: its extreme lack of polish, general bugginess, lackluster visuals, derivative gameplay mechanics, forgettable multiplayer…you likely get the point, by now. Reverence for the original film can only take you so far in a video game environment, and while there’s some cool homages and moments in the story mode, Colonial Marines just doesn’t add up to the fans’ expectations or the conventions of good FPS gameplay. This review was originally written for Reset Games, a video game store in the Pacific Northwest.